The book of Ecclesiastes, which hardly anyone reads nowadays, if they ever did, is part of the Wisdom literature of the Old Testament, along with Psalms, Proverbs and the Song of Solomon. There are two main reasons why no-one or hardly anyone reads it, I think. One is that despite its inclusion in the body of wisdom literature the general tone of the book has appeared to many to be sceptical and cynical, despite its reputed author being Solomon. People remember the phrase ‘Vanity of vanities, all is vanity’, the pessimism of the Preacher, and nothing much else. The second reason is that the book appears to have been ignored in the New Testament, for it seems that there is not a single quotation from Ecclesiastes to be found in it. So there seems to be no warrant for us as Christians to read and learn from it. I don’t take this view. Being part of wisdom literature, which has the function of applying the Old Testament torah to every day, we should open the book expecting to gain an insight into the sort of wisdom that ought to be practiced by the people of God. The second reason is more personal. 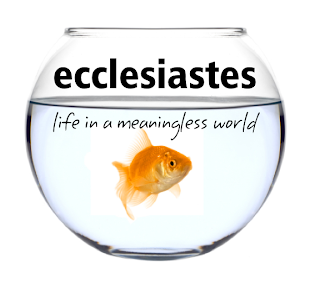 It has been said that of all the books of the Old Testament, Ecclesiastes comes the nearest of all to providing a ‘philosophy’, not in the sense that it offers purely rational arguments for its conclusions, but because it offers general conclusions about what is and is not worthwhile in life, a ‘philosophy of life’. It draws these general conclusions about life from what the author has observed gong on around him. Insofar as this is true Ecclesiastes has for me, a philosopher, an added interest. The argument of Ecclesiastes is first to show, as a result of what the writer has observed, that various well-known and obvious ways of living lead only to what the writer calls ‘vanity’. What does the writer mean? A vanity in this sense is something that does not last, but is insubstantial or fleeting or disappointing or unfulfilling as the key to how we should live. Whatever it might at first promise, it turns out never to fulfil it. A vanity is a goal, but not an abiding goal. We might think of what the writer calls ‘vanities’ as the outcome of our planning and searching; if we place our hopes upon them they will invariably disappoint. However, this fact does not prevent fallen human beings from hankering after and seeking fulfilment in such ends – which are abundantly available in the Vanity Fair of John Bunyan’s Pilgrim’s Progress, another book not much read these days. Ch. 1. Circularity, no end of all that happens is apparent ‘under the sun’ life, and lives go round. There is change but not progress. As the sun rises and sets, so a generation of human settle succeed an earlier, leaving it behind, and forgotten. And human satisfaction is short-lived. Self-indulgence is not the answer, for the author has been in the position of denying himself nothing – Ch.2. And even his technological success (v.4) gives no lasting pleasure. 'Behold what I have seen to be good and fitting is to eat and drink and find enjoyment in all the toil with which one toils under the sun the few days of his life that God has given him, for this is his lot. Everyone also to whom God has given wealth and possessions and power to enjoy them, and to rejoice in his lot and rejoice in his toil – this is the gift of God'. 8. 15 And I commend joy, for man has no good thing under the sun but to eat and drink and to be joyful , for this will go with him through the days of his life that God has given him under the sun. 9.7 'Go, eat your bread in joy, and drink your wine with a merry heart, for God has already approved of what you do. Let your garments be always white. Let not oil be lacking on you head. Enjoy life with the wife whom you live all the days of your vain life that he has given you under the sun, because this is your portion in life and in your toil at which you toil under the sun. Whatever your hand finds to do, do it with your might, for there is no work or thought or knowledge or wisdom in Sheol, to which you going'. 11. 6-8 'In the morning sow your seed, and at the evening withhold not your hand, for you do not know which will prosper, this or that, or whether both alike will be good…..So if a person lives many years, let him rejoice in them all, but let him remember that the days of darkness will be many. All that comes is vanity'. 12.13 'The end of the matter; all has been heard. Fear God and keep his commandments, for this is the whole duty of man. For God will bring every deed into judgement, with every secret thing, whether good or evil'. 5. 1f. Guard your steps when you go to the house of God. To draw near to listen is better than to offer the sacrifice of fools, for they do not know that they are doing evil. Be not rash with your mouth, or let your heart be hasty to utter a word before God, for God is in heaven and you are on earth. Therefore let your words be few. While we are to live in the present, we are not to live for the present. We are to do our best at work, and enjoy the company of those we love. These are God’s gifts to us now. As young people our tendency is to live in the future, investing all our hopes and energies in it; as older people, we tend to live more and more in the past. But both these attitudes should be corrected, by the recognition that God has given us the present. We don’t know what’s around the corner. In a way we should ‘live each day as if thy last’, and ‘for the great day thyself prepare’ as the old hymns put it. 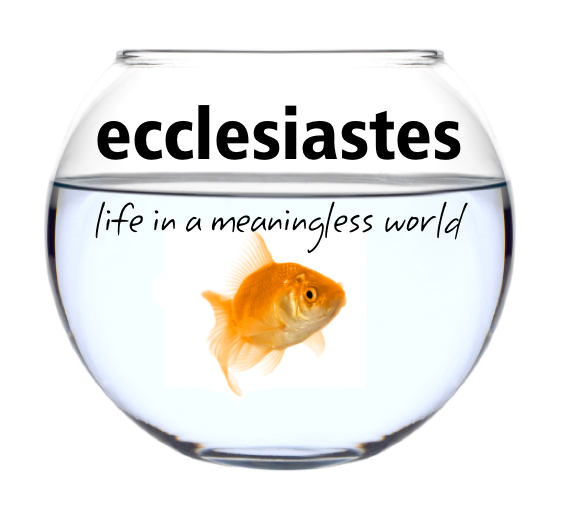 I hope to begin the new year by posting a couple of pieces on the book of Ecclesiastes. James Barr said somewhere that this book is the nearest thing we have in Scripture to a work of philosophy, and I think that this is correct. It is not a great work in philosophy, or anything like that, but it is reflective in a general way, and has some of the style of philosophical reflections. 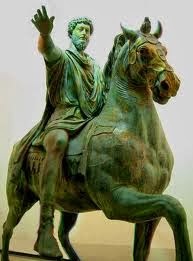 It's tone, or the mind-set of the author, gives it a resemblance to the Meditations of Marcus Aurelius, a Roman Emperor influenced by the Stoics, as I shall try to show. 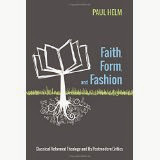 Besides this, we'll look at the teaching of the book, and at its relation to the New Testament. And there is stuff about our relation to time which I cannot resist. These posts are to celebrate a commentary of Ecclesiastes by a long-standing friend, Melvin Tinker, to be published in 2014. I have not yet read it - a treat in store - but my guess is that he and I will have a good deal in common. At least we'll both agree that the book has a positive message. It is not the work of a sour-minded and disillusioned king, but of someone who has come to realise where true satisfaction in this life is found, and what its limits are. In addition to this I shall draw attention to a new book on antinomianism by Mark Jones, another friend, who with Joel Beeke is the author of A Puritan Theology. And I've discovered that there's more to be said about the 'dual-aspect theism' that we encountered in the work of Rob Lister and his mentor Bruce Ware. In fact I think I've ferreted out another source if not the source of this idea that God is a duality, making it possible (it is said) to hold that God is timeless and also in time. For besides Rob Lister and his mentor Bruce Ware there is Scott Oliphint (in his book God With Us: Divine Condescension the Attributes of God (2012)) and his mentor John Frame. 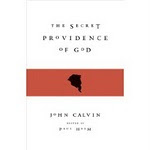 Frame offers the view in The Doctrine of God (2005) as well as in his recent one-volume Systematic Theology. So he another source. Nobody is to be accused of plagiarism! There is no issue of 'accountability'. The claim that this view is an 'improvement' upon classical theism and God's relation to the creation marks a significant change in the way that we are bidden to think of God, when judged by the Reformed tradition. With such an 'improvement' we get the treat of having our cake and eating it, but at the price of choking , as we shall see. Beyond this, who can tell? Even thinking that we can see as far as the first few months of the year is stretching things. Nevertheless I hope that you and your families enjoy a Happy New Year!